Our Music Store has a supply of popular teaching method books and Royal Conservatory of Music material for piano, voice, guitar, violin and theory as well as Conservatory Canada Classical and Contemporary Idioms books. We have all the new RCM materials. Teacher discount available. NO TIME TO WAIT FOR A SPECIAL ORDER? We offer digital downloading of music through the Hal Leonard website so many immediate needs can be met on the spot. SUPPLEMENTARY BOOKS, SHEET MUSIC, SEASONAL MUSIC for a wide variety of instruments. 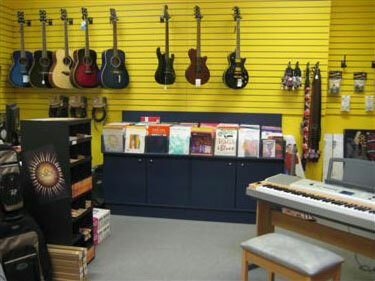 SCHOOL MUSIC REQUIRED ITEMS are in stock: recorders, ukuleles, band instrument mouth pieces, reeds and cleaning supplies, band method books etc. 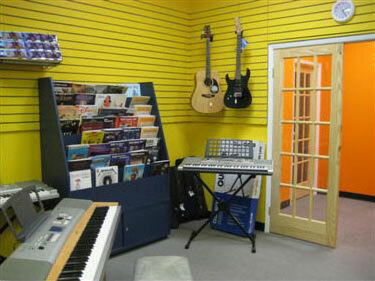 We sell guitars, strings and accessories, and keyboards and accessories. Unfortunately we DO NOT sell acoustic pianos at this location. Many other instruments, novelty and gift items are available. We also have a guitar repair technician on site. SPECIAL REQUESTS are welcome and we will do our best to find what you need as quickly as possible.